If you were looking for a fresh reminder as to why Vote-by-Mail is a terrible idea, why provisional ballots are not the same as actually casting a vote, and why there needs to be moreaccountability for and oversight of election officials, today's BradCaston KPFK/ Pacifica Radioshould fit the bill. 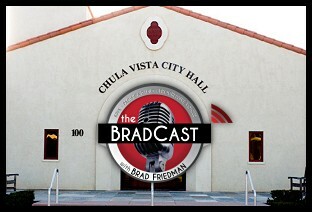 In short, we cover the election contest now pending in the race for City Council (Seat 1) in the San Diego County city of Chula Vista, CA. The certified results from the November 2014 election show a 2-vote margin between the John Mc Cann (R) and Steve Padilla (D) in a race with some 37,000 ballots cast. Mc Cann has been certified as the "winner". ALSO on this week's program: Accountability, finally, for an election official elsewhere ( in St. Louis County, MO), and the fake "voter fraud" activist set to testify at AG-nominee Loretta Lynch's very real U.S. Senate nomination proceedings. Plus, as usual, much more, including Desi Doyen with the latest Green News Report.